If you’re considering a visit to Warren-Tricomi you’re in for a treat! The glamorous hair salons have many prime locations in New York (and in other parts of the USA plus even further afield in exotic Tokyo). You’ll find one on Madison, one on Fifth Avenue, there is another located inside the plush Plaza Hotel. Finally, just a hop, skip and a jump away – for those who live in the Hamptons, there’s one on your doorstep. 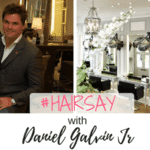 It’s not every day Hairsay gets some time to chat to a hair genius so when Edward of Warren Tricomi agreed to talk to us about some of his hair secrets and his busy life we were thrilled at the opportunity! Warren-Tricomi is one of the biggest names in New York – actually the name is renowned across the USA and that’s because it has celebrity status. Boasting big names such as Jerry Hall, Cindy Crawford, Jessica Parker and Julianne Moore this is so much more than just another hair salon. It’s the go-to for a long lasting blow-dry, seriously good color and a head-turning cut. Edward always dreamt of becoming a top hairdresser and actually wanted to be recognised for his work. Starting as a session stylist he definitely knows everything there is to know about hairdressing – from all angles, working on photo shoots, with fashion shows, with celebs (as we know) and of course – running his own successful business. His salon specialises in hair but it also has a state of the art beauty area so you can have head to toe pampering – a true luxury experience that no one should miss out on. Emma: Edward, what inspires you every day and where do you get your energy from? It must be hectic doing what you do! Edward: My inspiration has been building for 45 years and is a continuous process – it comes from all over. A lot of my inspiration comes from different online platforms, like fashion websites and leading magazines. I am also very inspired by history of fashion and I love using that as in my work today. I’ve worked on so many different types of beauty/fashion related events, like fashion shows and editorial shoots. I get very inspired working with some of the most interesting and renowned photographers in the world (i.e., Helmut Newton, Korda, Deborah Tuberville, Mario Testino, Steven Meisel, just to name a few). I’m always excited by these people and their talent and working together has always pushed me to be the best at what I do. My inspiration also comes from music and movies – watching and listening gives me new ideas for hairstyling and looks. Emma: What does a typical day in Edward’s life look like? 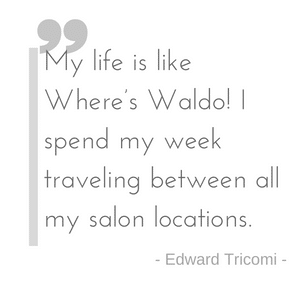 Edward: My life is like Where’s Waldo! I spend my week traveling between all my salon locations – I love the fact that I can be in Greenwich one day then the plaza and downtown the next. Flying all over the world to our other locations in India and Japan is also something that I love and do a lot. 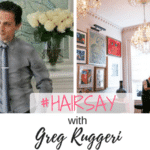 I also spend a lot of time teaching my hair stylists– I teach every Monday night and it’s very important to me to pass on techniques to new generations of stylists. I make sure to play music every weekend – I love to do that. I have a very full life! 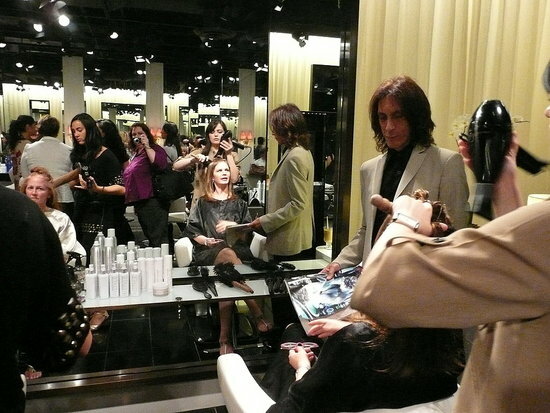 Edward: We have a product called “hot tools spray” that protects your hair from getting damaged. The spray is designed for using hot tools. If you are going to use hot tools, my main advice is that you always keep the tool moving. Never let the tool rest motionless on your hair if you don’t want to damage it. Edward: First and most importantly, we offer impeccable customer service. We also pride ourselves on having the most talented staff in the country. I believe we have the finest people working for us who I have trained myself. We always look very closely at trends too. If there’s a trend, we’re on it and make sure to understand it or we are creating those trends ourselves. We always want to be one step ahead of the hair trends by creating them ourselves. The salon is fantastic in that sense. We work on taking care of our clients, we want to provide them high end music and we make sure everything is perfect for them – even down to the sensual experience. We ensure that we use the best tools, which is very important for us and we love our job as well as liking people! 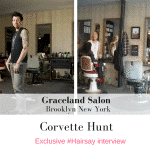 We have a real affinity for hair and the people who come to our salons recognize that. Edward: Curling and straightening irons in different sizes create different styles and looks. For me the “magic set” is achieved by blow-drying the hair straight, then sectioning the hair into 4 parts, into a ponytail. To perfect this look you curl each one of the four sections, let the hair down and finish with setting spray. If you want to have the perfect straight hair blow-dry you need to use a Mason Pearson brush, they’re the best. Boar head brushes are also a very integral part in creating a polished look when straightening hair. Steel metal round bushes create great sets when you want to have flexibility and fluffier curls. Edward: I wanted to be the best in the world I could be at something. I worked 8 days a week, on being the best I could be, I studied everything I could get hold of on the subject. I studied fashion design, paintings, art…these are a very important part of being a successful hairdresser as is knowing about the history of hair and fashion. I always said that being really good at something like being a bicycle wheel – and each spoke is a different strength – you have to be good, look good and be educated. I read the New York Times, Vogue, and WWD every day to know what is going on in the industry, and I believe that all successful people should do that. I practice my skills, sometimes that doesn’t even include hair, playing the drums has helped with hairdressing more than I could’ve ever imagined! I started cutting dry and I developed all my own techniques from my hard work and dedication to be the best hairdresser there is. Thank you Edward – we love your passion and dedication and next time we’re in the New York neighborhood we’ll be in to experience your exciting and innovative talents for ourselves!